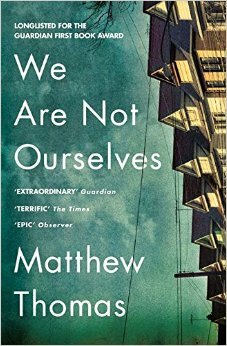 There was a variety of reactions to Matthew Thomas’ We Are Not Ourselves. Some people liked it, some mostly liked it but acknowledged its flaws, and we had two cases of intense dislike (though to be honest, both disliking members found parts that intrigued them or at least looked promising). We definitely had a lot to discuss! end up with a similarly cold and affectionless relationship with her own son. Eileen’s stoicism and focus was admired, and the methodical way she went about making preparations for Ed’s future- putting financial plans into action and organising ahead. We could see that despite her coldness, she was devoted to her husband, the one person that she had connected with properly. One member said that she liked the beginning and the end, but there was 500 pages in the middle that she just wasn't feeling. “Liking the bread but not the filling” as another member phrased it, which is a delicious way of looking at it. She also commented that when the narrative begins jumping from Eileen to Connell towards the end, this becomes jarring and doesn't work particularly well, which there was agreement on. After all, the whole book had been told in the third person from Eileen’s perspective, and then to suddenly have to cope with Eileen becoming “Connell’s mother” in the narrative, rather than her own character was quite alienating. We thought that there some very emotional episodes in the book, particularly during the later stages of Ed’s illness, before he goes into the care home. We all agreed that the dementia was sensitively portrayed and obviously very well researched, and that rather than being the main element of the plot, it was the catalyst for it, which is in contrast to many other books with characters suffering from such debilitating illnesses. We agreed too that it was incredibly sad that everything Eileen had ever worked and saved for, the life and possessions that she had craved for so long was all for nothing and that with hindsight, she would have done everything differently. To write off a whole life like that is sobering. We discussed the book’s attitudes to race quite extensively and talked at length about the pretty clumsy racial stereotyping that made some readers quite uncomfortable- the “Hispanic” youths that Eileen encounters in the street, the 'moment of redemption' Indian meal that she shares with her old house’s new owners, Angelo’s family upstairs and Bethany the cult member, who we keep being reminded over and over again is a black woman, complete with bangles and braids. One member commented that she could see that Eileen had some issues with racism despite being an émigré herself, but much of the problematic descriptions came from the third person narrator, and that’s when it becomes difficult to work out if these prejudices belong to the character (which is work-around-able) or whether they belong to the book. Which is a bit more problematic. The book's notes say that it took the author around 10 years to complete the book and we felt that that showed in the patchy quality of the narrative and the ways that the narrative styles change. Then there was all the baseball stats that nobody could make any sense of. Overall, we thought the book was *okay*, that it portrayed Altimeter's sensitively and accurately and caused emotional reactions from the reader. However there were parts that were very shaky, both structurally, character wise and in terms of the narrator/character point of view. It was commented that "I'm glad I read it, but I don't think I'd recommend it" which a lot of members agreed with. We all said it hadn't occupied our thoughts much since putting the book down. 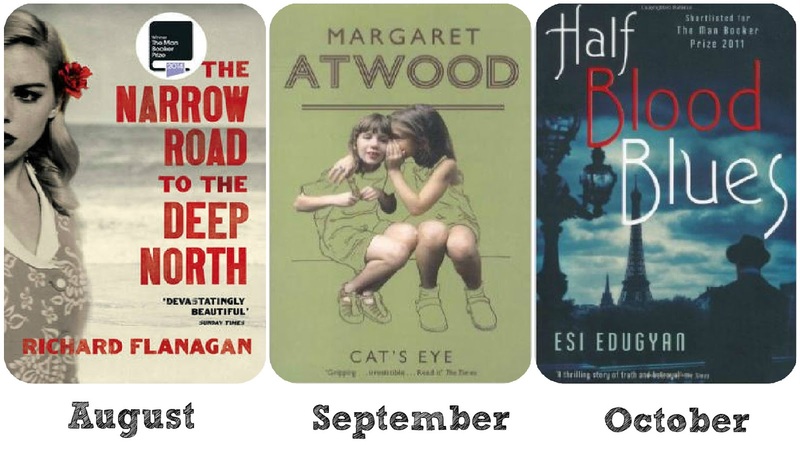 To honour Margaret Atwood's visit to Nottingham on September 26th, we've gone for one of her novels for that month's book, which is Cat's Eye, a booker nominee in 1989. 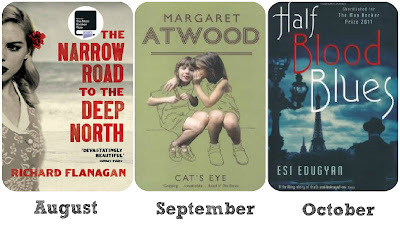 This also breaks up two war novels...as October's pick is Half Blood Blues, which was incidentally on the Booker 2011 shortlist. It wasn't meant to be this booker-y, but that's the way it's gone!